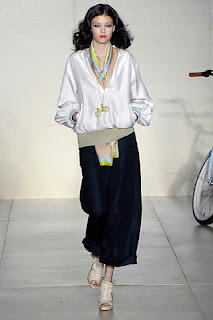 I wanted to like the Spring 2008 Cynthia Rowley show this past Friday. I really did. But unfortunately, I felt it fell flat of expectations. Perhaps it was due to the fact that everyone had to wait outside the venue -- in 90 degree heat -- for 45 minutes before being let inside. Perhaps it was the fact that we then had to wait another 50 minutes inside for the show to start, with no explanation as to why the show was delayed. (And as it wasn't in the tents but at Gotham Hall, this did not seem to make sense.) Or perhaps it was just because once the show began, the collection seemed disjointed at best. While the pieces were individually wearable, they just did not form one cohesive group. And the hair and makeup most certainly did not seem to fit the vibe of the show, which seemed to be fun-loving and free-spirited (evidenced by the models and Rowley herself riding down the runway and out of the venue on bicycles during the curtain call). The hair -- while pretty with center-parted, voluminous, flowing curls -- did not reinvent the wheel, while the vibrant magenta lipstick screamed "Let's revisit the '80s!" The eyes were interesting, with deep electric-blue liner emanating a cat-like vibe. When all was said and done, I was just left wanting more. Maybe that will come with the fall collection.